Making My 6th Doctor Costume: Eric and Weeble! I bought these little beauties a while back, but I thought it was time to share them with you. 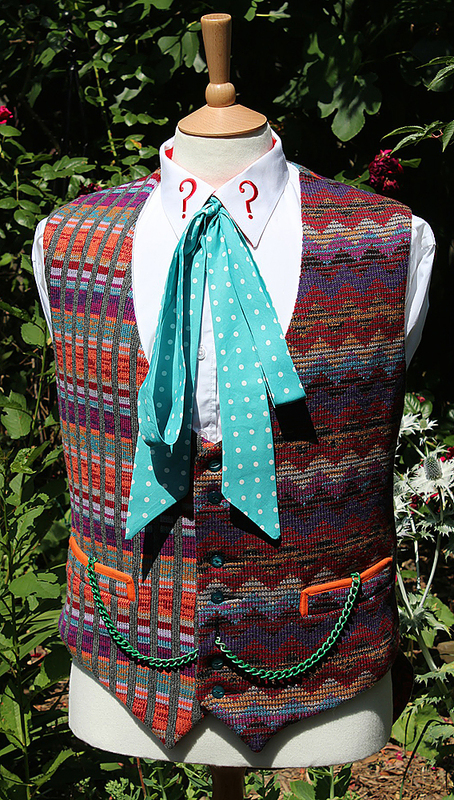 But before going into details of their background, I thought I do a quick run-down of all the cat brooches Colin Baker wore - don’t worry, there’s actually only seven. 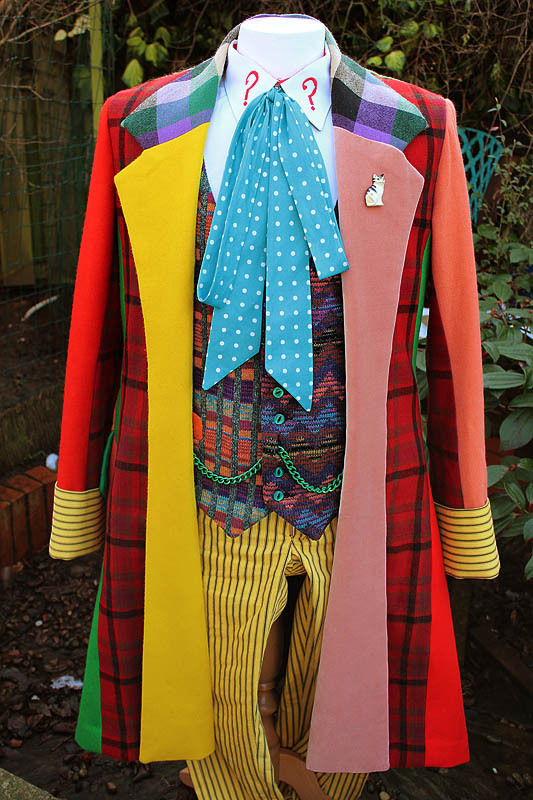 During his time as The Doctor, Colin Baker incorporated his love of cats into his costume in a couple of novel ways: inside the yellow lapel of his coat he added a cat silhouette for every adventure he got under his belt (see below, right); and on the pink lapel of his coat he had a cat brooch (see below, left). The apparent plan was to fill the yellow lapel with silhouettes, then move onto the pink, but this was completely abandoned after Revelation Of The Daleks, and the silhouettes were never seen again. The first brooch was a china tortoise shell cat, which was used from The Twin Dilemma through to Vengeance On Varos. I was lucky enough to get myself an exact copy in 1985, when the artist who created it did a very limited run of replicas (see left). 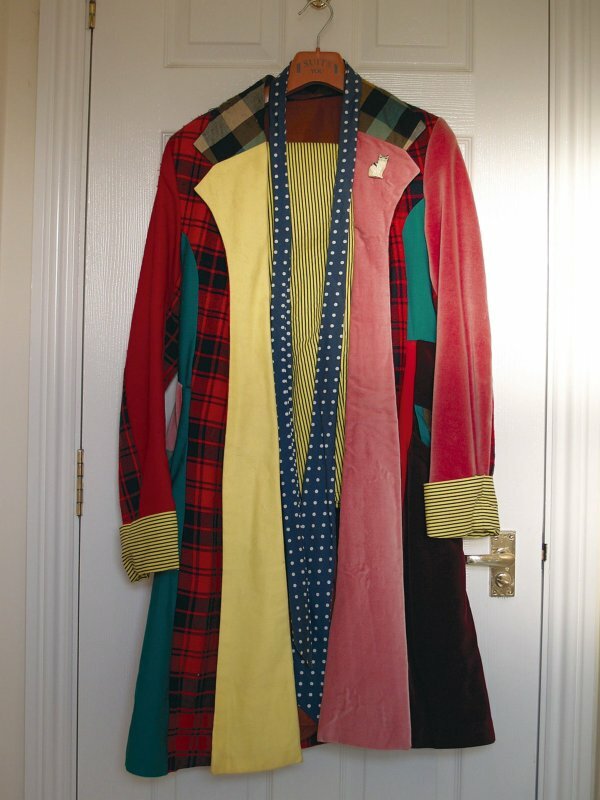 This is always the one that sticks in my mind, as it was used the most and I had one on my prized Sixth Doctor Frock Coat replica I had made (see right). Subsequently, Colin had a whole series of cat brooches, each of which he wore for barely one story each. 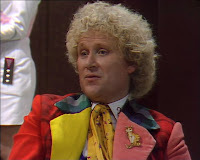 and for Revelation Of The Daleks he sported a rather cartoon-like white cat (see left, bottom). Following the 18-month hiatus, he returned with some new brooches, a couple of which have an interesting background story. 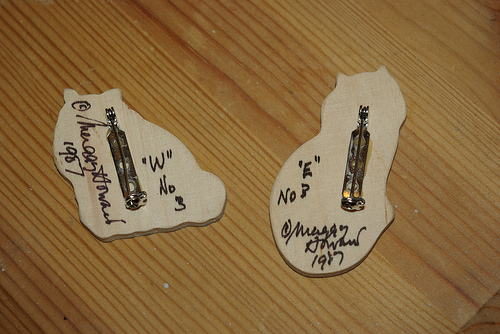 They were designed and created by Maggie Howard, and they were known as Maggie’s Moggies. 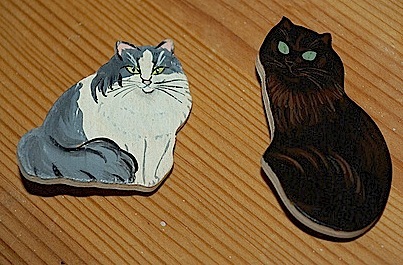 The brooches were based directly on two of Colin Baker’s own cats: Eric and Weeble! and the grey and white was Weeble (see below). 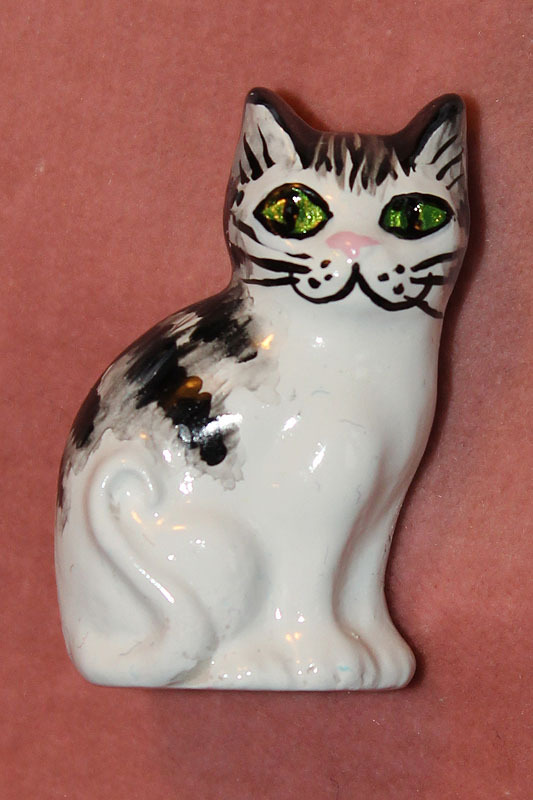 Just like the china cat I bought back in 1985, Maggie Howard then did a very limited number for sale in 1987. 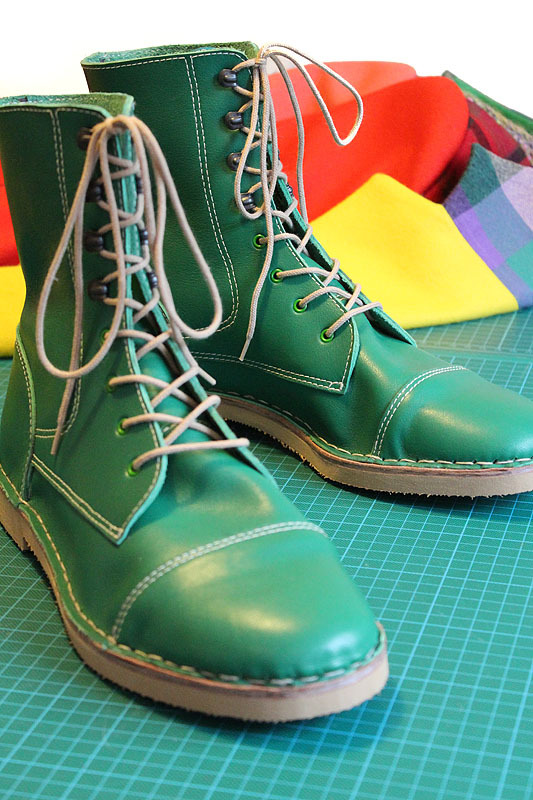 It would be incorrect to call them production made, as they are hand crafted replicas of the originals made by the original artist, so they’re as close as you’re going to get. The pair I have bought are numbered ‘3’ on their reverse, and are signed and dated by the artist. I have no idea what the extent of the run was, so am unable to gauge their rarity. 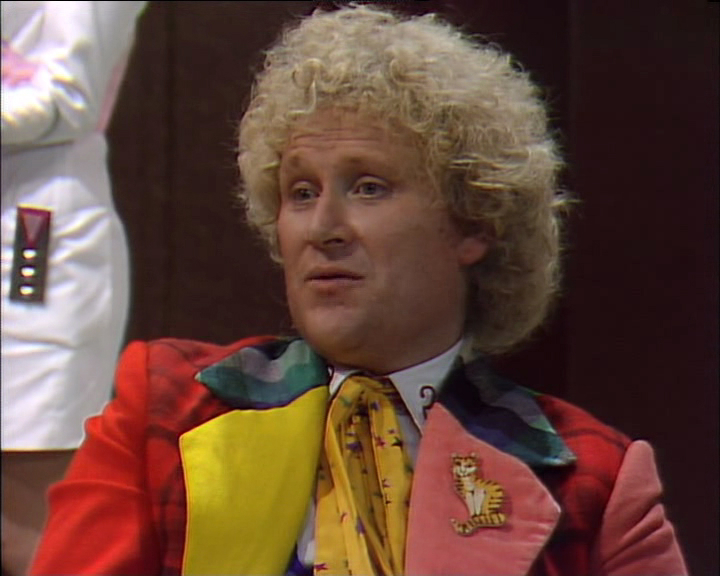 Just to be completist for this entry, Colin Baker was only seen wear one further cat brooch, a comic-styled ginger cat, in Terror Of The Vervoids (see left). Don't ask me how I knew, but somehow I knew Brooch Foure INSTANTLY. It's one of the young cats from Disney's The Aristocats. True that Colin Baker only wore seven badges, but if you want to be *very* completist the Sixth Doctor actually wore eight - at the start of Time And The Rani the coat has a grey-and-black Siamese pin on it. ^ Yep. The badge worn in Revelation is a Disney badge of the character 'Marie' from the Aristocats.